Swarovski offered the SCS membership in many countries when the Dolphins were revealed as the 1990 SCS Annual Edition. The multi-lingual Swarovski certificate for the Swarovski Dolphins was necessary to avoid the need for language-specific certificates like the Swarovski Lovebirds certificate. The authentic Swarovski Dolphins Certificate is an accordion style document with the certificate verbage in seven different languages: English, Spanish, French, Italian, German, Dutch, and Flemish. The Swarovski –assigned reference number is located on the back side of the certificate in a very small font. The Swarovski Dolphins certificate is DO4MM90XX. The Dolphins ‘Lead Me’ Certificate can also be found using another reference # DO1X901C, which was originally used in the Warner’s Blue Ribbon Books on Swarovski catalog. The Swarovski Dolphins COA was originally in a square white envelope when it was packaged with the crystal figurine. This original envelope is tissue-lined, and has the familiar Swarovski Swan logo on it and below that the letters SCS on the front side. A special thanks to Jane Warner, co-author to Warner’s Blue Ribbon Books on Swarovski for consulting on the Swarovski Dolphins Certificate article. Regarding availability and replacement value, the SCS Swarovski Dolphins Certificate is not readily available. At Crystal Exchange America, the last ones sold were in the neighborhood of $100 – $125, but that was in 2007. It is nearly always best to purchase the Swarovski SCS AE figurine complete with box and certificate, as it may not always be easy to find a replacement box or replacement certificate at what a collector deems a reasonable price to pay for it. As Swarovski SCS membership was growing globally, the need for the multi-lingual Swarovski certificate for the Swarovski Turtledoves was now a serious requirement. The Swarovski Turtledoves certificate was most like the accordion-style Woodpeckers, but with 2 additional languages. The genuine Swarovski Turtledoves Certificate is a multi-folding pamphlet with the certificate wording in the languages of: English, Spanish, French, Italian, German, Flemish and Dutch. The Swarovski – assigned reference number is positioned on the very back of the certificate in a tiny print.. The Swarovski Turtledoves certificate is DO4M882. The Turtledoves ‘Amour’ Certificate can also be found using the reference # DO1X891C, which was initially employed in the Warner’s Blue Ribbon Books on Swarovski catalog. The Swarovski Turtledoves COA was originally in a square white envelope when it was packaged with the crystal figurine. This original envelope is tissue-lined, and has the familiar Swarovski Swan logo on it and below that the letters SCS on the front side. A special thanks to Jane Warner, co-author to Warner’s Blue Ribbon Books on Swarovski for consulting on the Swarovski Turtledoves Certificate article. Regarding availability and replacement value, the SCS Swarovski Turtledoves Certificate is not readily available. At Crystal Exchange America, the last completed sales were in the neighborhood of $50 – $125, but that was in 2008 through 2011. It is almost always wisest to purchase the Swarovski SCS AE figurine complete with box and certificate, as locating replacement packaging or COA documentation may be easier concept than accomplished idea. As the Swarovski SCS memberships were being offered worldwide in 1988, the need to support multiple languages was a growing concern. Back then, you simply did not find shelved products, instruction booklets, etc with multiple languages on. What was purchased in the USA was English, and what was purchased in Spain was in Spanish. It is MUCH different in today’s world. So when Swarovski offered the SCS membership more regions, it was becoming increasingly necessary to have Swarovski COA documents available for the Swarovski Woodpeckers in multiple languages. The English and English-French variations of the Swarovski Woodpeckers COA are indistinguishable on the front, and include the same picture of the crystal figurine on the inside. The differentiation between the two is whether or not there is the authenticity information in French on the inside left side of the COA. However, the Multi-Language Woodpeckers COA is significantly different. It is more of an accordion-style with a single photo and 5 different languages on the mini-foldouts. The Swarovski Woodpeckers COA was originally in a square white envelope when it was packaged with the crystal figurine. However, most of the time, an envelope for the certificate is not presently included with the Swarovski Woodpeckers. This original envelope is tissue-lined, and bears the official Swarovski logo on the front side. The Swarovski –assigned part numbers are generally found on the back panel in a very small font. 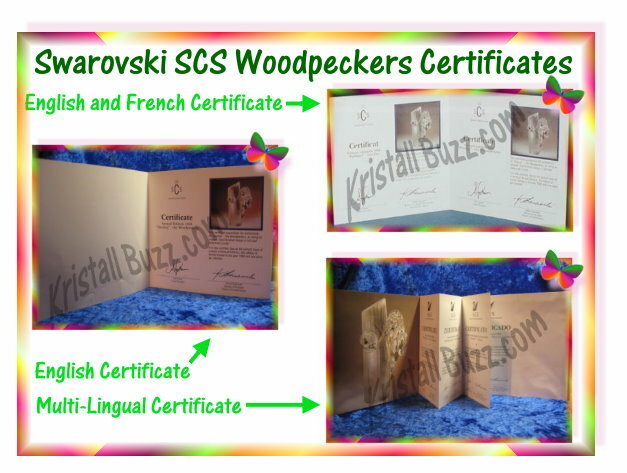 The Swarovski Woodpeckers Multi-Language certificate is DO4M991. The Swarovski Woodpeckers English certificate is DO4E871. I was unable to locate the Swarovski Woodpeckers English and French certificate number. The Woodpeckers Certificate can also be found using another reference # DO1X861C, which was originally used in the Warner’s Blue Ribbon Books on Swarovski Price Guide. It is important to remember that the Swarovski Woodpeckers, like all other Swarovski AE figurines, does have a COA that is specific to it. Less knowledgeable collectors and ebay traders have posted online auctions selling their figurine to include the original box and certificate, but the auction picture revealed Woodpeckers with a generic product booklet instead. A special thanks to Jane Warner, co-author to Warner’s Blue Ribbon Books on Swarovski for consulting on the Swarovski Woodpeckers Certificate article. If the language of the certificate is important to a client, then I would recommend that this be taken into account when determining a value for the Woodpeckers certificate. The Swarovski Woodpeckers English and French Certificate recently sold on Ebay Canada for under $15. And the Swarovski Woodpeckers Multi-Language Certificate may be more readily available in the Euro community, so checking with a professional brokerage service or Ebay sites there would be the best venues for determining a replacement value or obtaining them as they are harder to find here in the USA. The SCS Swarovski Woodpeckers Certificate (English version) can normally be found in the $75 to $150 price range. Crystal Exchange America does have the English version of the Swarovski SCS Woodpeckers Certificate at their store website. The Swarovski COA is definitely important for some figurines, but the ones in the image above are the interchangeable generic product booklets. Swarovski SCS figurines and Swarovski AE figurines should have certificates. In many cases (but not all cases), limited edition figurines have a special Swarovski COA. 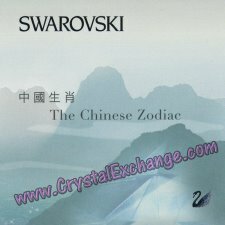 Not all sellers are knowledgeable about Swarovski because they are not serious collectors. 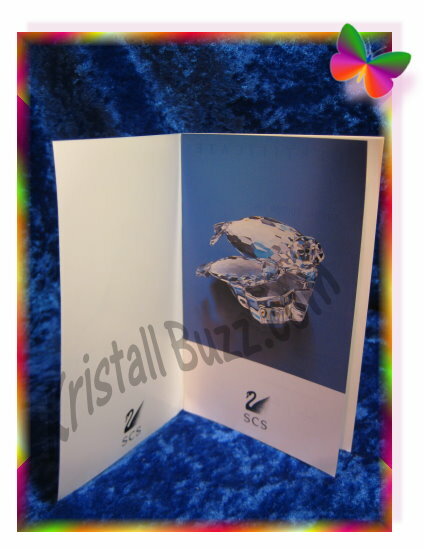 For a Swarovski Annual Edition, the seller may include the generic product booklet in lieu the true Swarovski COA. This would likely be a costly mistake for an unskilled collector who does not know what the ‘complete package’ should include. Purchasing a special (correct) Swarovski COA may not be an easy task as they are typically harder to find and can be expensive to purchase separately. Wrapping up, this should serve as a reminder to thoroughly read auction descriptions, view the auction images if there are any, and ask questions if there might be contradictory information. 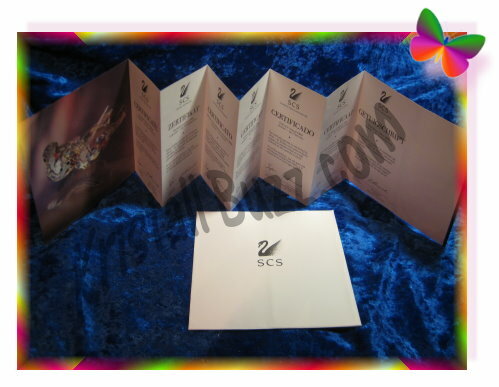 Use caution when an auction for an Annual Edition states Swarovski COA included, but shows an image of the generic product booklet. When in doubt, ask questions about the items included for sale and what the seller’s return policy is. When the transaction is finished, the buyer should be happy with outcome final price. 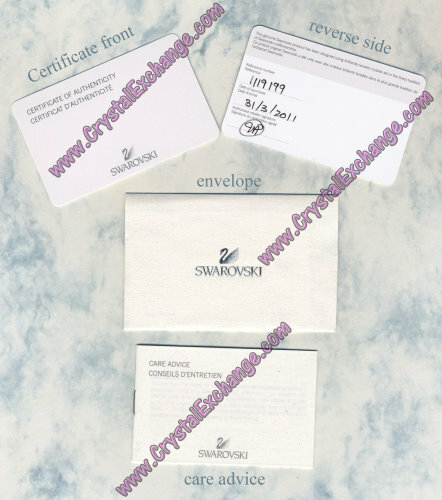 Swarovski Certificate of Authenticity – How Significant is it? For the most part, I have addressed the question about the importance of the Swarovski Certificate of Authenticity at the Crystal Exchange America web site. First and foremost, if the crystal figurine in question is a Swarovski Limited Edition figurine, or a Swarovski Annual Edition, the Certificate of Authenticity is important to retain the highest value, and sell-ability of the figurine. This is because avid Swarovski Crystal collectors prefer to have ‘the complete package’ when purchasing retired Swarovski. 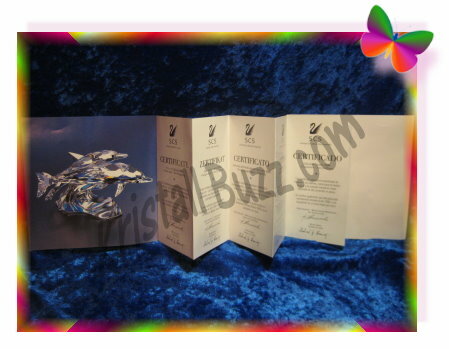 When the Swarovski figurine in question is not any type of special edition, then Swarovski includes a ‘generic product booklet’ titled ‘certificate’ with the figurine when produced. Given this type of certificate is generic and interchangeable between products, the significance is lower. Nonetheless, some Swarovski fanatics will certainly pay extra money when purchasing discontinued Swarovski crystal figurines to ensure they have that ‘complete package’. Regarding current Swarovski products, the company states that they cannot replace a Swarovski Certificate of Authenticity. They do recommend that customers retain their receipts for any warranty issues that may arise. The company has used at least eight different Swarovski certificates since 1976. The first three have an octagonal shape. They were used from approximately 1976 to 1988. From 1988 to 1995, a square white Swarovski certificate was used. 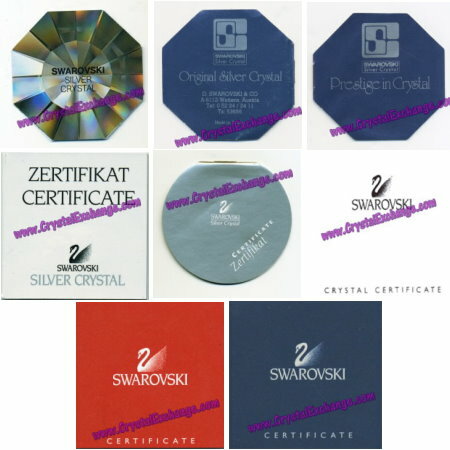 The only round Swarovski certificate was used from 1995 to 2000. Since 2000, a variety of square certificates have been used, including issues in white, blue, and reddish-orange. If you have a special edition figurine missing the certificate, Crystal Exchange America has some Swarovski certificates listed on their site. If you are seeking the Swarovski Certificates more generic in nature, Crystal Exchange America has a few sets listed in the online auctions running for the next 30 days. Swarovski has provided its SCS members a sneak preview into a “Good Luck” series that will soon launch. Swarovski’s delightful figurines, “Lucky Gifts”, should have a global appeal, embracing many cultures and their symbols for “good luck”. Per the sneak peek on the Swarovski site, I found five Swarovski Lucky Gifts: Swarovski Lucky Cat – this crystal gift represents Japanese tradition; Swarovski Lucky Clover – a world-wide symbol of good luck; Swarovski Lucky Elephant; Swarovski Lucky Dragon – this gift inspired by Chinese tradition; and Swarovski Lucky Lady Bird – a crystal ladybug that is also a multi-cultural symbol of luck. The article did not make any obvious reference to the size or the Swarovski product line they will be a part of. I was a bit surprised when I read that they will each come in a blue velvet pouch with a gift card. I can’t help but wonder why the items would not be sold in the popular blue Swarovski box or cylinder with an accompanying Swarovski certificate. A cost savings measure for Swarovski collectors? Or perhaps the pouch and gift card are in addition to the standard packaging? These Swarovski Lucky Gifts are quite cute! They remind me of the colored figurines: Swarovski Lovlots. Color pictures are on the company web site for Swarovski collectors who want more information about them.